Size 5 - $60.99 Size 6 - $60.99 Size 7 - $60.99 Size 8 - $60.99 Only 6 left! Size 9 - $60.99 Size 10 - $60.99 Only 8 left! Ready to rock the world as Wonder Woman? We think the residents of Earth have gone long enough without the Amazing Amazonian watching their back and these boots are sure to have you back in the saddle in no time! If you've put the time into crafting your Wonder Woman costume, you're going to want to make sure your style is complete from head-to-toe when you add these Wonder Woman boots to your superhero costume! With these stylish boots as a part of your hero gear, you're going to have just the right touch to accent your costume. When you start swinging that golden lasso we think that you're going to look particularly stunning! 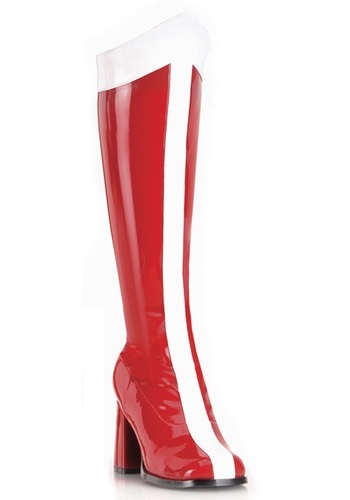 These knee high red boots have a thick vertical stripe down the front and along the top cuff. 3" heels add to your already heroic stature so you can stoically stand tall and survey the scene. Black bottom soles and inside zip up means these costume boots might actually be practical to wear, too! We're sure that after you've wrapped up all of your costumed fun, you're going to be very tempted to bust these boots out for a little fun comic book style every now and again!